The Costa Mesa Playhouse is a 73-seat, not-for-profit, Community Theater that has been serving greater Orange County for over 40 years. The Playhouse is dedicated to presenting affordable, quality, live theater in a comfortable and intimate setting, and to offering the talented actors, singers, dancers, and stage craftspeople of Orange County a welcoming environment in which to practice their craft. With a season running from September through June and five productions per season, the Playhouse offers a diverse array of plays and musicals to our theatergoing public. 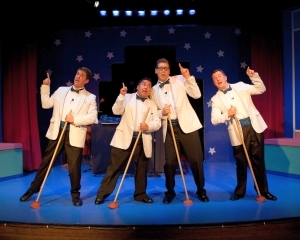 The Costa Mesa Playhouse operates under the stewardship of a volunteer Board. All board officers and members donate their time in support of the overall organization and also act as producers for individual productions. Most of the behind the scenes duties at the theater, including set construction, facility maintenance, and ticketing/reservations to name just a few, are performed by the Board and a small group of community volunteers. Funding is provided by revenues generated by ticket sales, generous donations from our patrons, and the various fundraisers the Board organizes throughout the season. Though located on the campus at Rea School, we receive no monetary support from the city or school district. All revenues come from ticket sales, subscriptions, and the generous donations of our patrons and are directed back into the productions at the Playhouse and toward general operating costs. Donations are greatly appreciated, and you can volunteer to help. Getting involved with the theater is a great way to contribute to your community. In general, the majority of funds for a production are focused on securing the rights to the show, set construction/materials, costumes, production staff fees (director, musical director, choreographer, set design, lighting design), and when possible, advertising. When musicians are hired, they are generally professionals and require payment. Since funds are extremely limited, the cast, crew, and producers receive no compensation for their time, energy, and dedication to each production. Despite the limited availability of funds, whenever possible, the Playhouse strives to give back to the community. Some of the ways we are able to do that is by offering the use of our space to community groups for theater related activities such as acting classes or rehearsals, donation of free performances to local school children and their families along with in-class sessions related to the piece being performed, and donation of a portion of our proceeds to community groups relating to our productions such as veterans groups or AIDS organizations. While financial obligations do not always allow us to do everything we want, we enjoy being creative in finding ways to give back. The critics agree, the 2011 - 2012 season has kicked off with a great production of Noel Coward's "Blithe Spirit" and continued throughout the year ending with a superb production of "Hedwig and the Angry Inch". If you didn't have the opportunity to attend any of the last season's productions, you missed some wonderful performances. To read all the reviews, click on the "Press Room" tab on the menu. The dedicated and talented cast and crew at CMP has donated many hours of hard work to perform for you. Make plans to enjoy the fruits of their labor by visiting our online box office today. Thanks for visiting us on the web. We'd love to see you in person at the Playhouse!